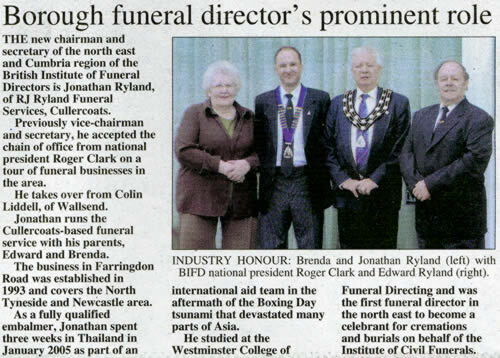 THE new chairman and secretary of the north east and Cumbria region of the British Institute of Funeral Directors is Jonathan Ryland, of RJ Ryland Funeral Services, Cullercoats. Previously vice-chairman and secretary, he accepted the chain of office from national president Roger Clark on a tour of funeral businesses in the area. He takes over from Colin Liddell, of Wallsend. Jonathan runs the Cullercoats-based funeral service with his parents, Edward and Brenda. The business in Farringdon Road was established in 1993 and covers the North Tyneside and Newcastle area. As a fully qualified embalmer, Jonathan spent three weeks in Thailand in January 2005 as part of an nternational aid team in the aftermath of the Boxing Day tsunami that devastated many parts of Asia. He studied at the Westminster College of Funeral Directing and was the first funeral director in the north east to become a celebrant for cremations and burials on behalf of the Institute of Civil Funerals.